Hop aboard our Luxurious Mercedes Sprinter for a relaxing drive down to Hollywood California, sit back and relax in our Sprinter with reclining seats, cold air conditioning and a video screen. Experience the beautiful Southern Nevada and California desert while en route to the bright lights of Hollywood, guided by your driver along your way on this day trip from Las Vegas! You will enjoy a lunch at the Hard Rock Cafe, right on Hollywood Boulevard, before taking a walking tour and getting behind the scenes of Hollywood. After your walking tour, you will get to see the Dolby Theater, home of the Academy Awards ceremony! Depart Las Vegas from a centrally located tour terminal aboard our Mercedes Sprinter and travel through Southern Nevada on your way to Hollywood, California! Enjoy lunch at the world-famous Hard Rock Cafe right on Hollywood Boulevard. After enjoying your delicious "Acoustic" lunch, you will meet your expert guide who will be taking you on your journey behind the scenes of Hollywood! 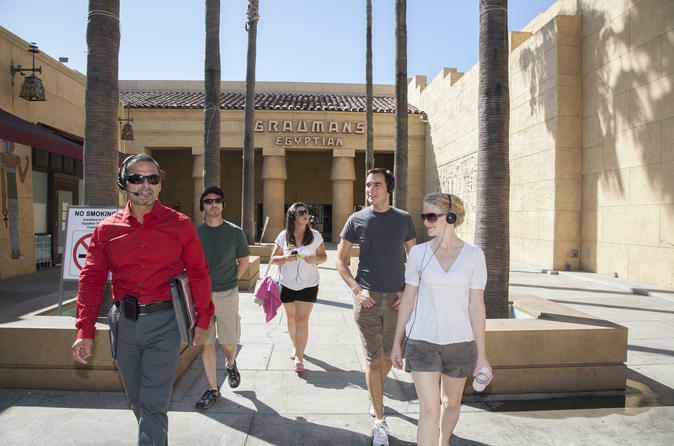 The Hollywood Behind-the-Scenes tour is a world-renowned experience that connects visitors with the Hollywood they have seen on tv and in movies! Visit movie locations that stared A-List celebrities such as Julia Roberts, Keanu Reeves, Sandra Bullock, Mark Wahlberg, Charlize Theron, Cameron Diaz, Drew Barrymore and more; visit legendary movie palaces, find your favorite celebrity’s star as you walk on the Walk of Fame, view the Hollywood sign and visiting celebrities’ favorite hidden hideaways. You will also have the opportunity to go inside places normally closed to the public. Place your feet onto your favorite celebrity’s footprints at the Chinese theatre and walk the footsteps of multiple movie stars when you visit the Awards Walk - home to the Academy Awards. This tour changes your Hollywood visit from ordinary to extraordinary! After you're Behind the Scenes of Hollywood tour is completed, you will head over to the Dolby Theatre where you can experience all of the renowned elegance and glamour that the Home of the Academy Awards® has to offer. Inspired by the elegance of a European opera house, with state-of-the-art technical capabilities, the Dolby Theatre has been host to many of the world's top performers including Celine Dion, Prince, Steven Tyler, Alicia Keys and the Dixie Chicks. After this full day in Hollywood, you will board your coach for your relaxing drive back to Las Vegas.